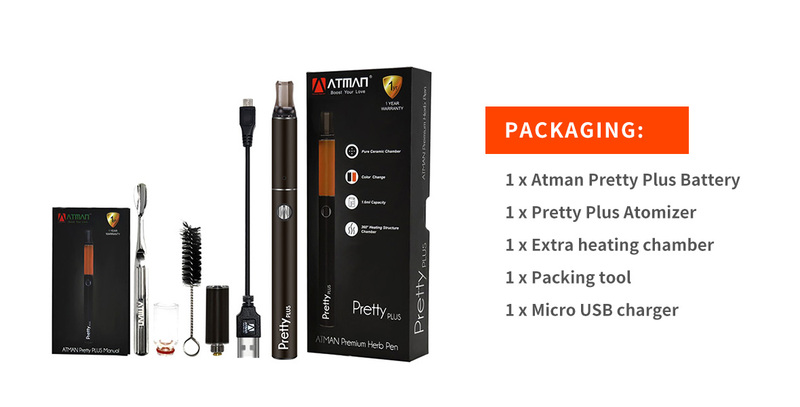 The Atman Pretty Plus electronic vaporizer is designed in high tech portable dry herb vaporizer, coming with orange alert, to indicate customers when it is ready to vape, and warn us it is getting hot, do not touch it directly. Once the temperature reaches 113°F, the color of tank start to change to orange, when it reaches to 122 °F, it will be totally orange color. 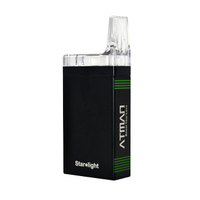 When it is ready to vape, the light will turn to green color. When stop working, and cool down to 100°F, it will be back to the normal color. 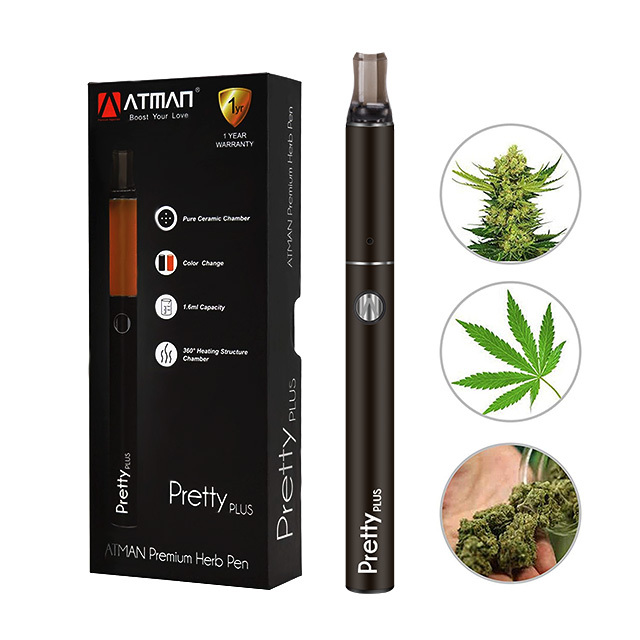 It is in Pen style for dry herb, with 360°heating structure chamber in ceramic mega volume for dry herb. 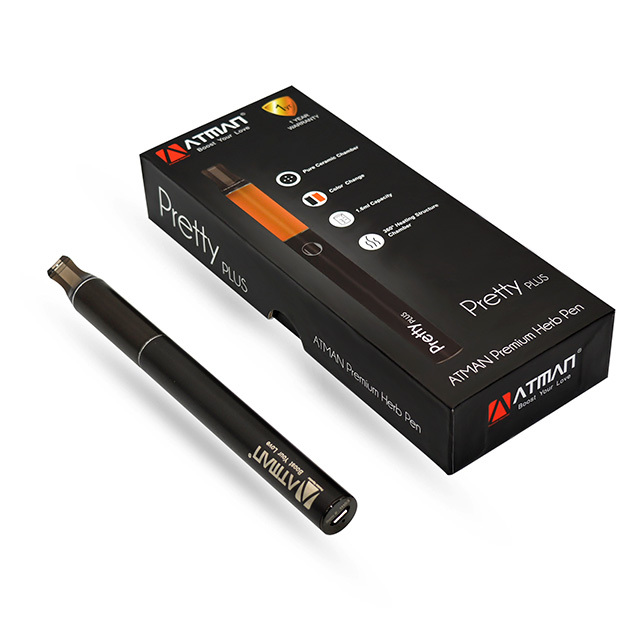 Ensure pure taste of vaping. 1. 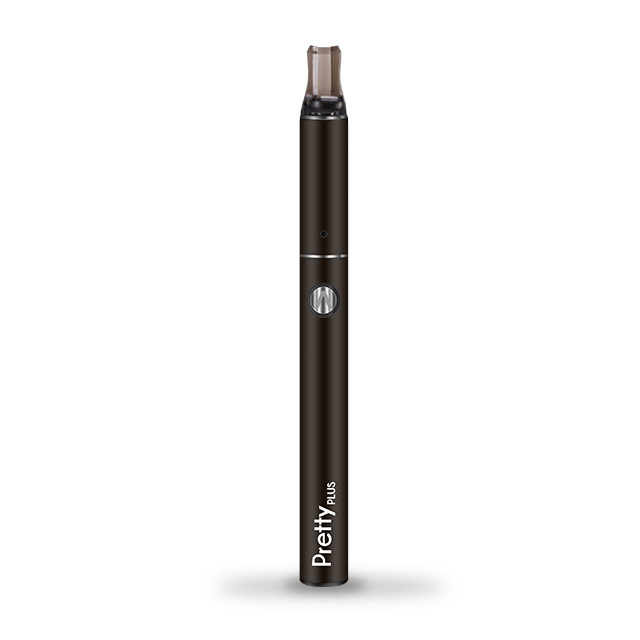 Pretty Slim vape pen smoke for dry herb in 14mm Diameter. 2. With high tech design, coming with color change, orange alert. 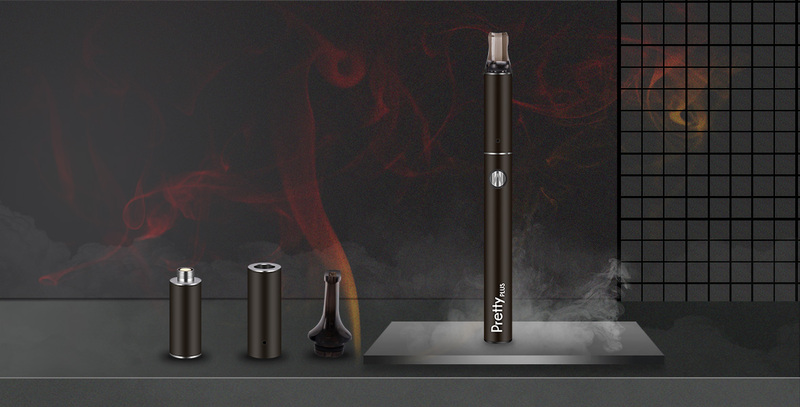 To tell when it is ready to vape, and warn customer the atomizer is getting hot, do not touch it directly. 3. Coming with ceramic tank, ensure pure taste. 4. New heating structure, ensure 100% heating up. No waste. 5. 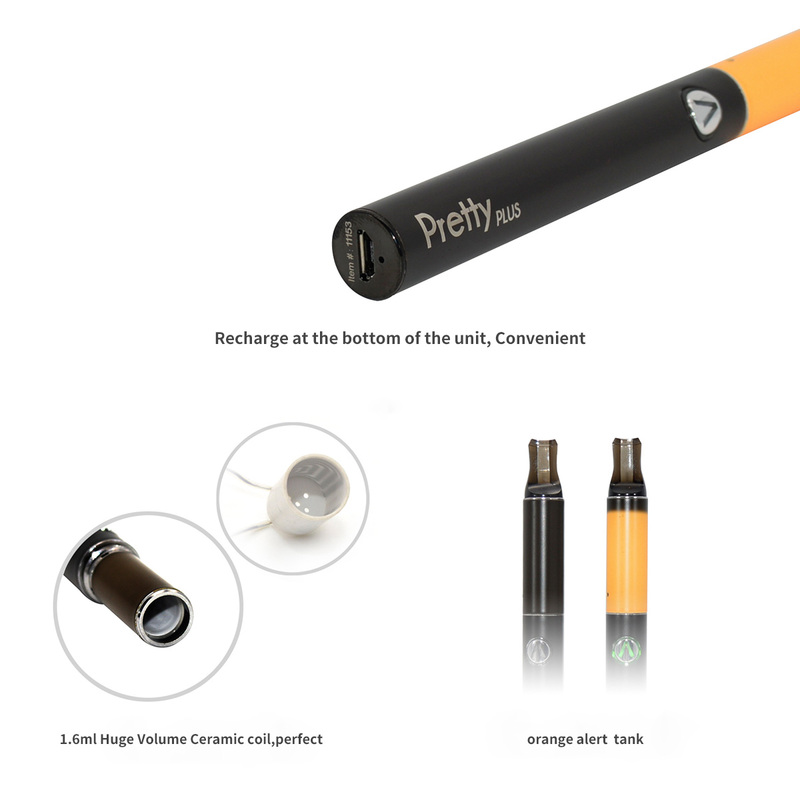 High drain lithium battery, supper enough power, ensure it can reach 400°F in 30 seconds. 6. Unscrew the tank cover to fill the dry herb. 7. Bottom Micro USB charging way. 1. 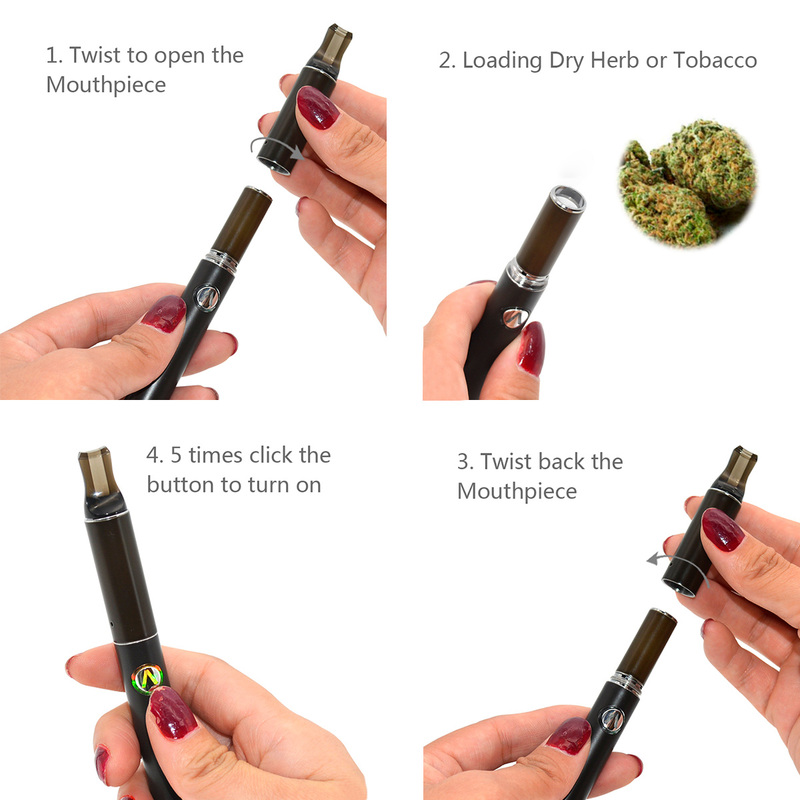 Unscrew the tank cover with mouthpiece, loading the dry herb into the heating chamber. 2. Screw back the tank cover with mouthpiece. 3. 5 times click on the button in 2 seconds to turn on the device, the green and red LED lights around the button will flash 3 times to indicate. keeping heating. After 30 seconds, the device will stop working, and the green light will light off. To save power and prevent over-vape. 5. Once it is in heating status, the color of tank will start to change to orange, when it reaches 122°F. It is designed in high tech coming with orange alert. 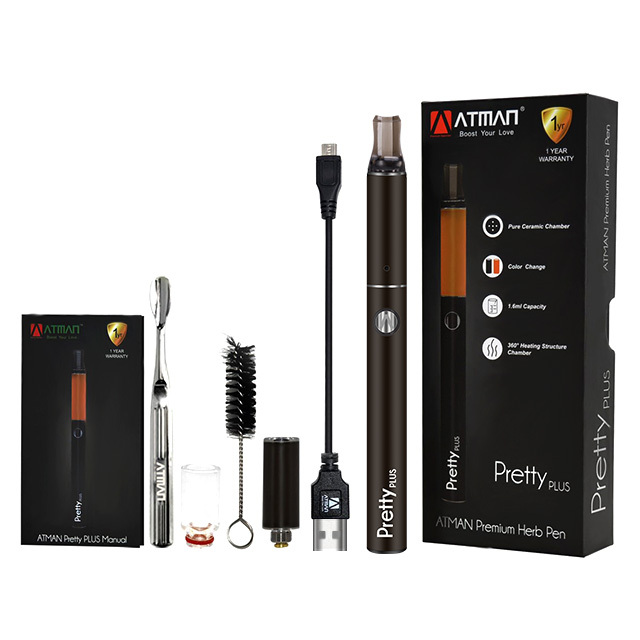 To indicate customer it is ready to vape soon and To warn customers should be careful of the atomizer, in case of getting hurt. And take it far away from Children’s reach. 6. 5 times clicks on the button in 2 seconds to turn off the device after no use, the LED light will flash 3 times to indicate. 7. If the device is under heating status, and you want to turn it off. Please firstly hold the button for 3 seconds to stop heating before turning off. 8. The device will turn off automatically in 120 seconds if no use or no any active on button. To protect the device. 9. When the device is cool down to 100°F, it will get back to the normal color as the battery color. To indicate it is all cool down, you can hold it or touch it freely. Charge Bottom Micro USB charger. Load the USB charger to the device, the bottom red LED light will light on and when charging is finished, it will light off. 1. Low Voltage protection:The device will stop working when it is lower voltage, meanwhile the red button light will flash 8 times to indicate it’ s time to charge. 2. 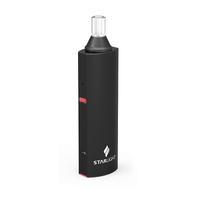 Short Circuit protection: When the atomizer is short circuit, The device will stop working and red button light will flash 3 times to indicate Short Circuit happening. 3. Over time protection: With 80 seconds cut-off, when it constantly works for 80 seconds, it will cut off and stop working, the green button light will flash 3 times to indicate over-time working. Reset the button, and you can use it again. Take off the heating chamber, and using brush or ethanol alcohol to clean it after use. Please make sure it is cool down and get back to the normal color before cleaning.